Learn the latest in web mapping, remote sensing/UAV, location intelligence, spatial analytics, and more. Our ever-evolving curriculum integrates the latest innovations to ensure you gain a relevant skill set that can be put to work immediately across a range of commercial and open source platforms. Take advantage of this program’s flexibility and customize your curriculum to match your career goals. Course options are continually updated to reflect the latest industry developments. Focus on mapping, management, and analysis of geographic data as you learn to identify and assess potential threats, vulnerabilities, and consequences within a geospatial context. Choose from two different tracks — a foundational track for the newer professional or an experienced professional’s track for those who already have a relevant certificate or license. This program provides students with hands-on experience using the latest tools in the GIS industry. Gain an understanding of how GIS facilitates data analysis and communication to address common problems. This USGIF–accredited program can prepare students to pursue opportunities in the rapidly-growing geospatial analytics market. Gain an introduction to the theory, methodologies, and ethics behind the professional application of geospatial intelligence. This 13-credit program is designed for students with little or no experience in this area, to help them learn how to apply analytical skills in ways that can solve problems related to national security, disaster response, or industrial challenges. Use the web mapping and coding skills you’ll learn in this certificate program — which requires no previous programming experience — right away in your career or use the program to gain accelerated admission to the Master of GIS program. Build on your GIS knowledge by learning how to leverage data gathered from drones, satellites, and lidar. This program focuses on remote sensing, terrain mapping, and image analysis and draws upon the resources of one of the most respected online GIS programs in the U.S.
We’ve worked with more than 6,000 students on all seven continents since 1999. Our students and alumni work in over 150 geospatial companies and organizations around the world in every major sector of the mapping, GIS, and GEOINT industries. 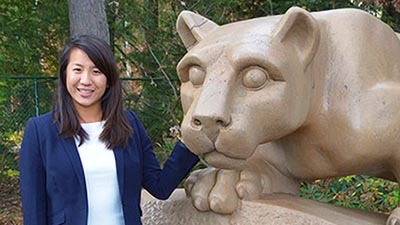 While working at Amnesty International, Angela Chang managed research projects incorporating the use of geospatial intelligence methods to monitor and document human rights abuses in Africa, Asia and the Middle East. The findings have been used to corroborate witness testimony and have helped influence U.S. government policies in these areas. Chang received the prestigious Lt. Michael P. Murphy Award and now works in intelligence for a U.S. federal agency. Learn More.